This year, it raised money for the first time—a $110 million investment led by General Catalyst. Grammarly has achieved all of this by focusing relentlessly on a single core value: helping people communicate better wherever they write online on a daily basis. Let’s dive into exactly how Grammarly grew their business to almost 7 million daily users—and where they can go from here. If you’re familiar with Grammarly, you probably encountered it first through its free browser extension for Google Chrome. The free extension highlights any major spelling mistakes you make when you type anywhere on the web. Upgrading to the paid plan gives you access to a deeper feature set including grammar and plagiarism checks, as well as contextual advice to improve your writing. The core grammar-checking and writing product is the same service that Grammarly has offered for years. What’s interesting is that unlike most companies, Grammarly didn’t begin as a freemium business. It actually monetized backwards. As a self-funded company, Grammarly began by selling to the enterprise. They used revenue from universities to improve the core product, before expanding into the consumer market. By the time Grammarly transitioned to freemium, it was already profitable with millions of users—and could fund a freemium plan to drive even more new user acquisition. Then, the company expanded its product so subscribers could use the tool directly in Microsoft Office, and then with web applications via a Google Chrome extension. That’s when their user growth really took off. Let’s walk through each stage of Grammarly’s business development—from its beginnings as an enterprise product to its current state as a freemium powerhouse. Today, Grammarly’s product uses sophisticated algorithms and machine learning to spit out billions of writing recommendations a month. But back in 2008, when Grammarly first started, they were trying to cobble together a product that worked with limited resources at their disposal. Using feedback and revenue from those customers to improve the product. When you’re self-funding a product, you typically don’t have a lot of cash to invest into the business. You have to sign up paying customers as soon as possible to get your burn rate under control. 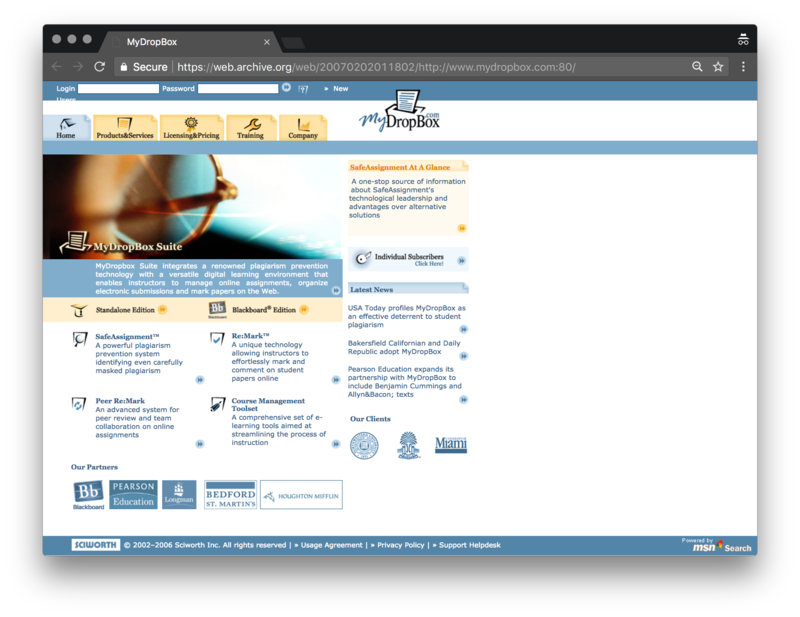 Before Grammarly, the two co-founders had created plagiarism-checking software called MyDropbox in 2002. By 2007, MyDropbox had expanded to 800 universities and roughly 2 million students. The problem was that the product had a narrow, academic use-case, which limited growth potential. The co-founders won’t say how much they sold MyDropbox for, except that the amount was minimal. With their next product, Grammarly, Shevchenko and Lytvyn had learned their lesson. From the beginning, Grammarly was designed to be a product that actually helps people write better—a problem with a much bigger market opportunity than MyDropbox. While plagiarism is a problem that universities care about, writing and communicating is a problem that everyone cares about. Grammarly 2008-2009: The original, bare-bones Grammarly product was simply a WYSIWYG editor that you could copy and paste text into. 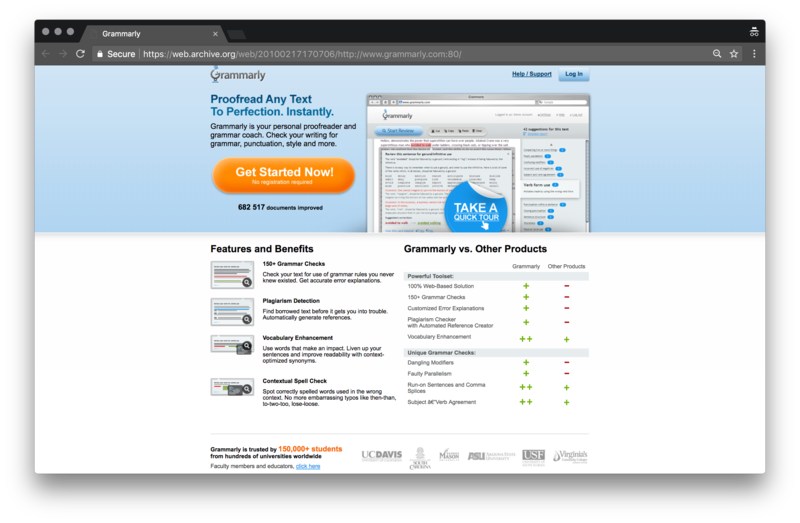 2010: As Grammarly first grew its product, it focused on students and education on its landing page. At the time, Grammarly counted over 150,000 students as registered users. 2011: Grammarly continued to develop the education market. By 2011, Grammarly counted 300,000 students as registered users and 250+ universities as customers. Grammarly’s early product was a simple web app. 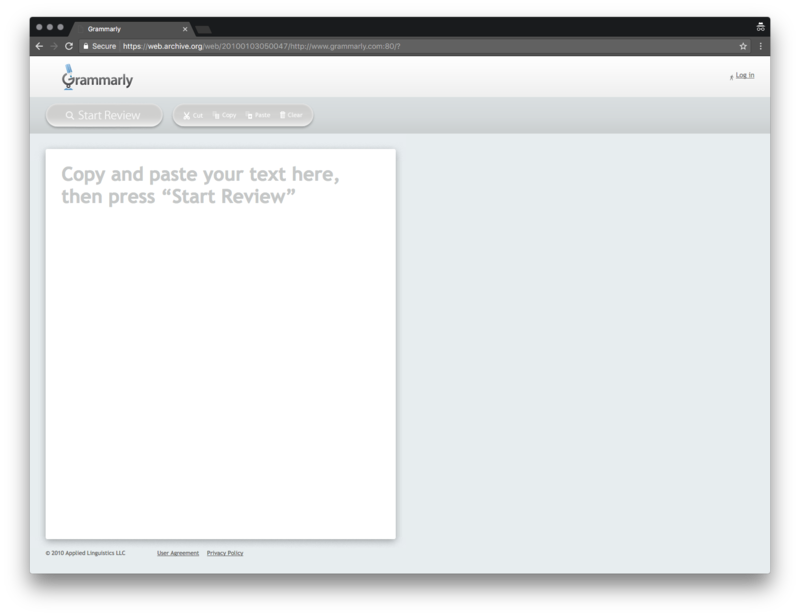 You could copy-paste text into a web editor and hit the “Start Review” button. The product would highlight any mistakes in the text and provide a list of suggested writing improvements. Unlike Microsoft Word’s spell checker, which only scanned for obvious spelling and grammar mistakes, Grammarly handled everything—from contextual spelling to style. Rather than trying to build a perfect—and expensive—algorithm from day one, Grammarly relied on user recommendations to improve its product. This steady stream of feedback meant that Grammarly was constantly getting better, while competing products like Microsoft Word stood still. As Shevchenko said, “Our objective was to focus on the problem [and] solution rather than on investor attraction.” That meant selling to universities and improving their grammar-checking product. And this simple, early strategy was incredibly successful. According to one source, Grammarly was already making $10 million in revenue a year, three years after it was founded in 2012. When you’re starting to turn a profit and see success, that’s the exact moment you have to hit the gas pedal to expand. Although Grammarly had achieved early success that few companies see, growing into a multi-million dollar business, they didn’t sit still. Selling to universities was profitable and had funded Grammarly’s early business, but growth was hampered by long sales cycles. At the same time, Grammarly noticed a big uptick in growth along customer segments beyond students and academics. These two factors tipped the scales and drove the team to build out the consumer business. For the consumer plan, Grammarly offered a seven-day free trial, and charged $11.99/month on a paid, annual plan. Over the next couple of years, consumer subscriptions outpaced enterprise contracts—eventually growing to 80% of total revenue. 2012: As Grammarly shifted to target a broader consumer audience, they began to invest heavily in social channels like Facebook and Twitter. 2013: Grammarly began tweaking its landing page to target a wider market. 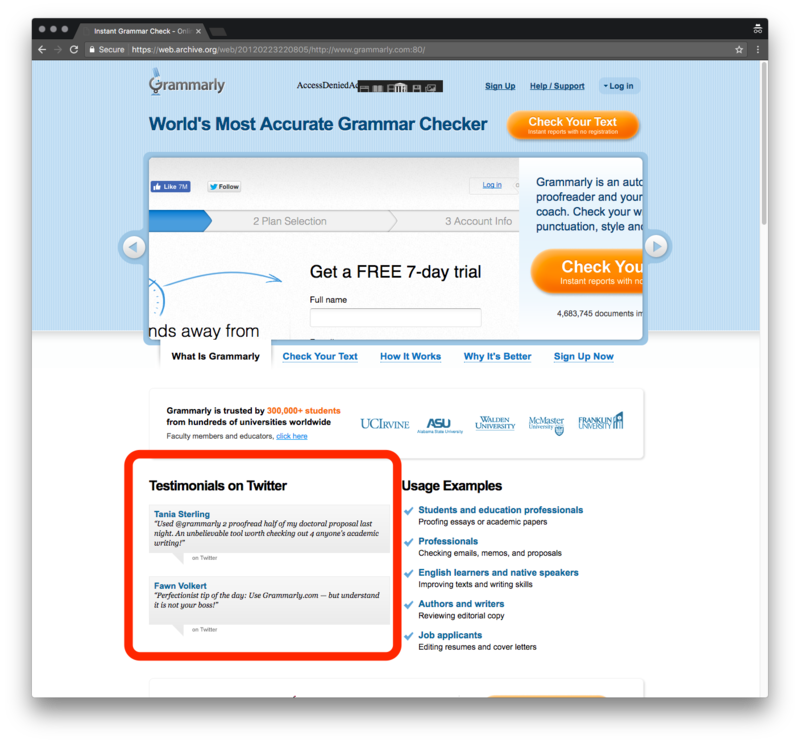 The tagline on the landing page read “The World’s Best Grammar checker,” while the snippet of social proof read “Trusted by 3,000,000 People” (rather than simply students). At the same time, Grammarly grew its Facebook following to over 1 million fans. 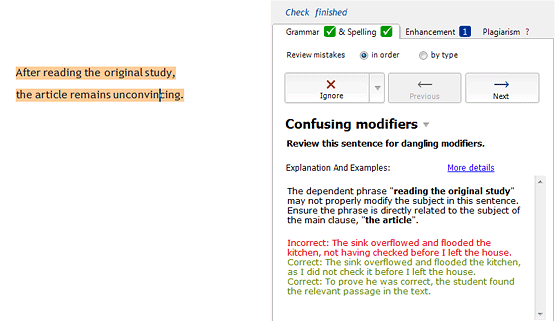 2014: Grammarly launched MS Office plugins, allowing users to access Grammarly’s grammar checker and plagiarism detection technology directly in Word and Outlook. Moving to the consumer market meant that Grammarly had to pay a lot more attention to marketing and how new customers were coming into the top of its funnel. Early on, Grammarly created content directed at grammar geeks and posted it to Facebook. But as social media manager Kimberly Joki says, “It was a small, specialized audience, and it just didn’t deliver.” So the company reconfigured its approach. Rather than simply posting about common grammar mistakes, the company started crafting content around a variety of use-cases—from posts on resume writing tips, to a interview with Weird Al, to professional email writing advice. By 2013, Grammarly had over a million Facebook followers. By 2016, they had seven million. The first step toward this goal was building a plugin for Microsoft Word and Outlook. Suddenly, users had access to Grammarly right where they spent most of their time actually writing. What Grammarly understood was that you can’t just wake up one day and decide to change your core customer segments. You have to execute that shift deliberately through your channels, marketing, and product. For Grammarly, this calculated approach worked. By 2013, Grammarly had achieved 2,326% revenue growth from 2009, with over 3 million registered users. Building out the consumer business and MS Office plugins were the first steps on Grammarly’s road to nearly 7 million daily active users. The launch of Grammarly’s free Google Chrome extension and transition to a freemium business model was the next step for shifting the growth engine into gear. The success of the Microsoft Office plugin made Grammarly’s team even more convinced that they had to put their product where people were actually writing. And that meant real-time, inside a web browser. By 2015, Grammarly users weren’t just writing stuff in Microsoft Word. They were writing memos in Google Docs, typing emails in their browsers, and filling out job applications online. 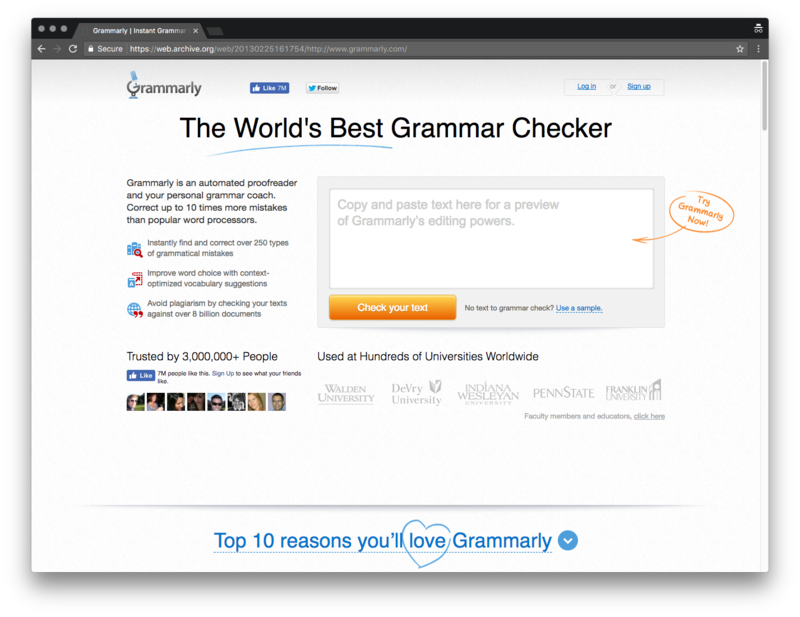 With its free browser extension, Grammarly reduced friction for users by placing the product anywhere there was a form field online. In an interview, Grammarly Head of Growth Yuriy Timen said, “ There are north of two billion English writers around the world and we believe that our product can and should be used by all of them.” Shifting to a freemium business model meant that Grammarly could once again expand its market and put itself directly in front of users. 2015: Grammarly launched its free browser extensions for Google Chrome and Safari. The company switched to a freemium consumer model. 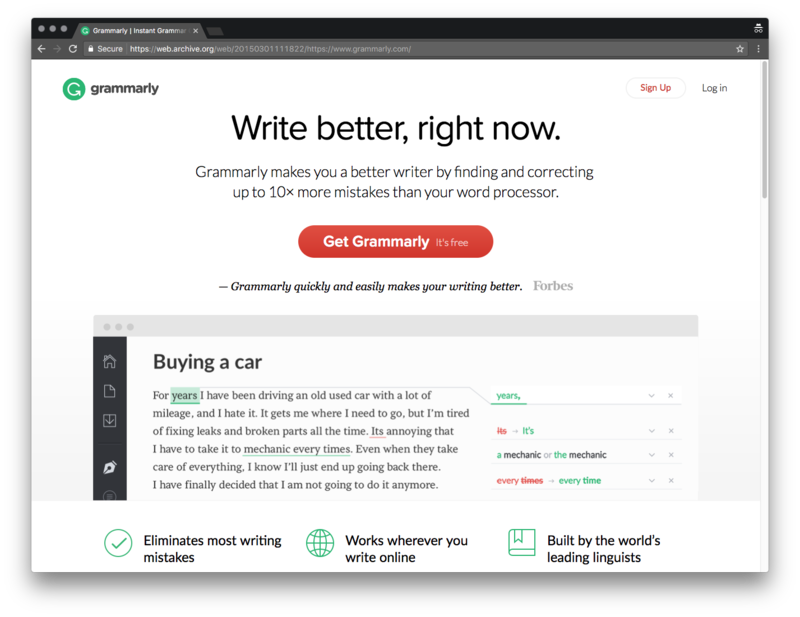 Grammarly’s landing page makes it easy to install the Chrome extension by clicking on the “Get Grammarly—it’s free” call-to-action. 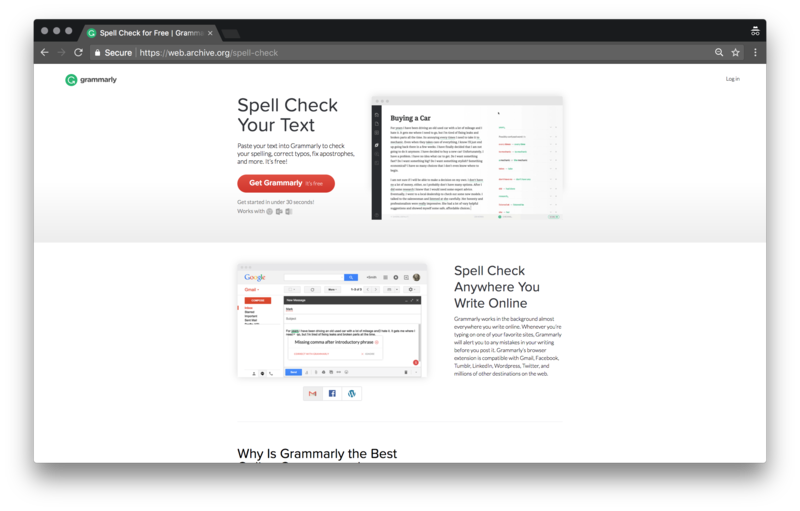 2016: Grammarly followed up on its hugely popular Chrome extension with additional extensions for Safari and Firefox. 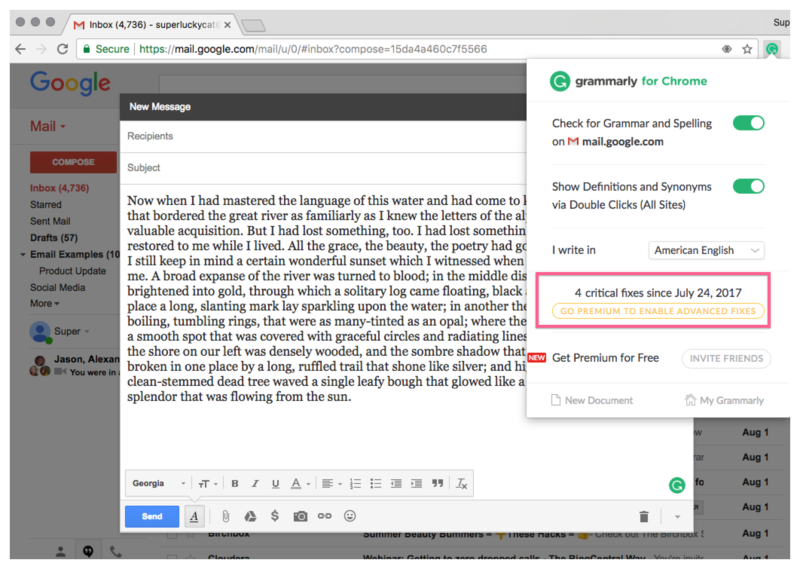 2017: Two years after launch, Grammarly’s free Chrome extension alone has over 8 million active users and more than 8 million downloads on the Chrome Webstore. 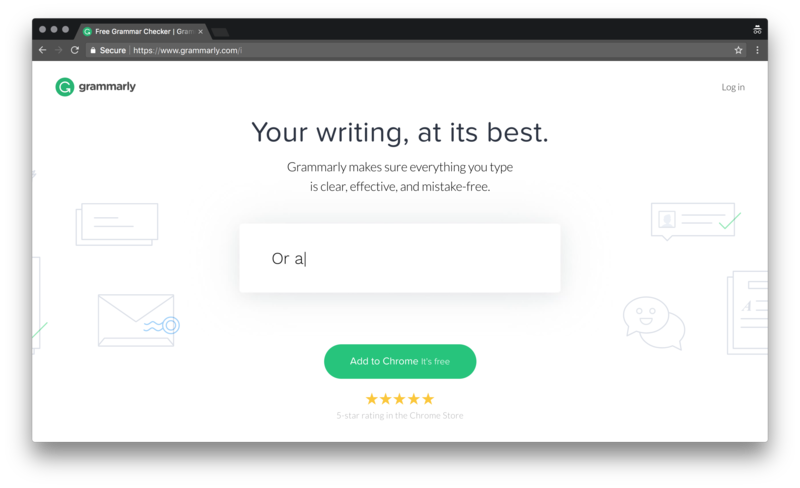 Grammarly’s marketing site was revamped to get new users to install the extension right off the bat. Strategically, building a freemium business around a Chrome extension has served two big purposes. First, by reducing friction and making its product more accessible, Grammarly put itself ahead of potential competitors like Microsoft Word and Google Docs. 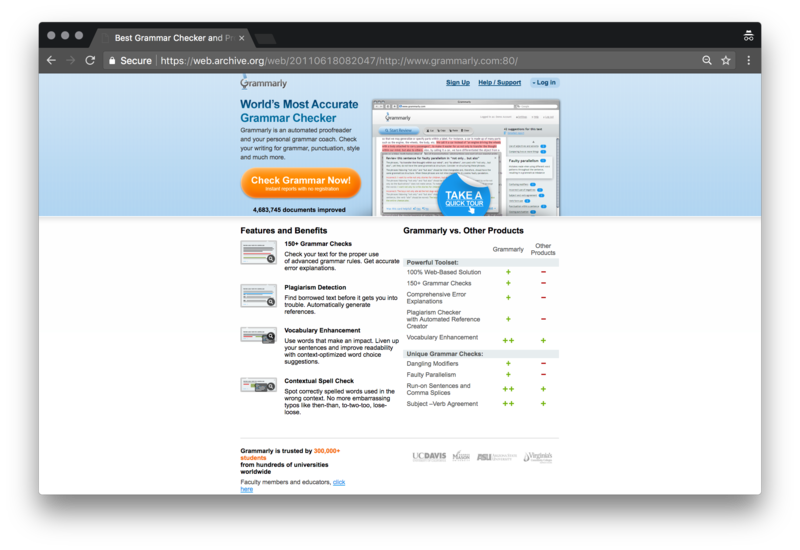 While these products have built-in spellcheckers, Grammarly’s product was not only 10x better, but could be accessed anywhere people typed. Second, it created a bigger funnel and a more logical upsell path to Grammarly’s premium product by offering new users immediate utility for free. 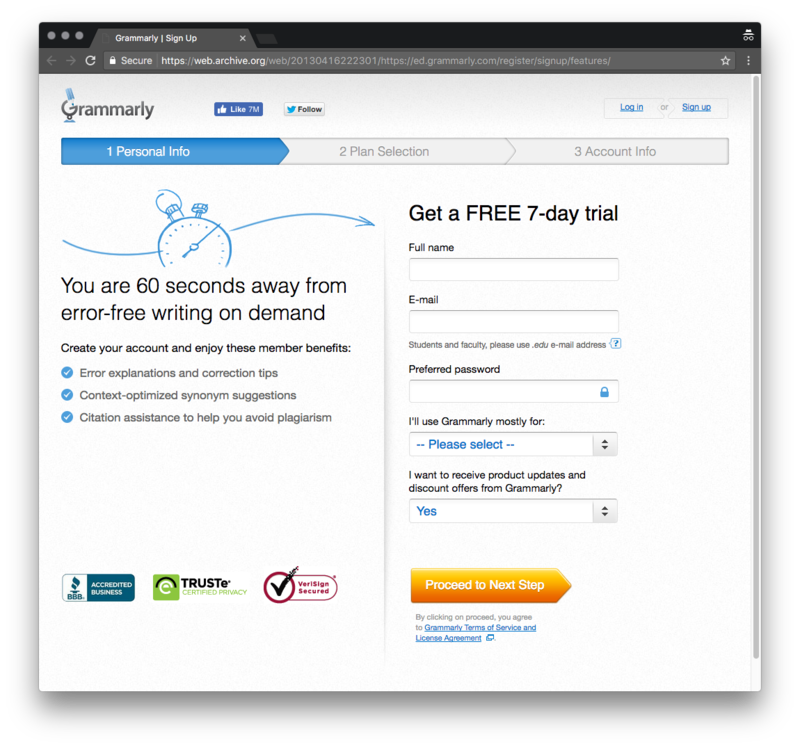 Instead of trying to convert people after a seven-day free trial, Grammarly could monitor usage of the free plan and use that data to drive conversions. In the browser, Grammarly’s Chrome extension shows users on the free plan how many fixes Grammarly has enabled with an upsell message. Grammarly personalizes each email according to user behavior, and only populates the email with an upsell message if the recipient uses the product enough to justify the cost. Companies like Dropbox and Trello have used a freemium business model targeted at consumers to “land-and-expand” bigger business and enterprise accounts. Grammarly did the exact opposite. It focused on profitable niches like education and universities to fund its growing product before building out a freemium business to rapidly expand. Grammarly is nine years in, and just getting started. This year, the company took funding for the first time, raising $110M in a round led by General Catalyst to ramp up hiring, as well as the machine-learning algorithms powering its product. While AI and machine learning have been all the rage in the current tech hype-cycle, Grammarly is actually using these new technologies to solve real problems that millions of people face every day. Machine learning and AI: Every time someone is typing while using Grammarly’s Chrome extension, web app, or MS Office plugin, the company is collecting data they can use to make its product better. The latest application of this is the launch of Grammarly Insights 2.0. Insights sends users a weekly trend report about how they write, which includes everything from vocabulary metrics to productivity. In the future, Grammarly might use machine learning not just to provide a better algorithm, but to deliver highly personalized recommendations to users. Attack new channels: As Grammarly’s marketing efforts begin to tap out paid search and content channels, there’s a lot of room for the company to experiment with new channels for acquisition. One of these is television. I moderated a panel with Grammarly’s Head of Growth, Yuriy Timen, who talked about the company’s efforts with television ads and billboards. With such a wide product that anyone can use, these broadcast channels give Grammarly an opportunity to expand its reach. Back to the enterprise: The biggest threat to Grammarly comes from Microsoft and Google—both of which have a lot of machine-learning expertise and are closing in on the productivity space. Grammarly can defend against this threat by moving back into the enterprise space. As Grammarly expands its market, it will continue to build out its self-serve enterprise product, Grammarly @ edu, to target universities and institutions. While AI and machine learning have been all the rage in the current tech hype-cycle, Grammarly is using these new technologies to solve real problems that millions of people have every day. Grammarly’s website states: “Our mission is to help everyone succeed through better communication.” It’s a hugely ambitious goal—and one that Grammarly has made significant progress on over the years. A lot of product-driven companies fall into the “build it and they will come” trap. They make the mistake of focusing on the hard, technical problems, thinking that revenue will naturally follow. Grammarly succeeded because it: 1). Built a great product and 2). Baked the product into distribution. If Grammarly had stuck to building the best web application for checking grammar, it would have remained an extra layer on top of products like Microsoft Office or Google Docs. If Microsoft or Google built a slightly better, native grammar checker, there would be no reason for customers to pay an additional $12.99/mo for Grammarly. Building a free Chrome extension reduced friction for people who wanted to use Grammarly, which in turn, multiplied the number of ways people could use the product. As a Chrome extension, Grammarly follows its customers everywhere they go on the web—whether they are sending work emails, writing a book in Google Docs, commenting on Reddit, or tweeting. The difference is this: between building a product that people use once or twice a week to check grammar on an important email, or building a product that people use wherever they write, every single day. I’m not saying that building a computational linguistics machine is easy. But I suspect that Grammarly’s success has as much to do with the distribution of the product as how well it works. Everyone loves to talk about the growth hacks that led to double-digit growth for other companies. While these tactics make for good stories, one-off hits don’t build a sustainable business. Grammarly has been able to double metrics like customer acquisition and revenue each year through small, incremental wins that compound over time. They experimented with a mix of content forms, from images to text posts. Then they applied those learnings to new channels like Twitter and television. If you want to drive growth for a company today, don’t spread yourself thin trying to tackle every channel at the same time. Figure out where your customers spend time online, and what the most effective channel is to reach them. Perfect your outreach on that channel before moving on to the next one. Many businesses forget to think about their business model. A lot of companies today, especially in SaaS, focus on selling their early product to other startups and small companies to drive initial growth. Then they move upmarket for more revenue and bigger contracts. Grammarly did the exact opposite. They started selling to the enterprise, before pivoting to one of the most successful freemium companies on the internet. It worked because the core of Grammarly’s product is all about helping people write better—something they do every day. While the education market was the most obvious starting point for the product, sticking to education would have constrained Grammarly’s growth. Grammarly revised its business model to tap into the biggest opportunity available for its product. There’s no cookie-cutter formula for building a business. If you’re building a company today, look carefully at how you’re monetizing your product—and all the ways you aren’t. Your current cash cow often isn’t the one that will continue to expand the business five or ten years down the line. Over the past nine years, Grammarly has quietly built one of the most successful businesses out there, with plenty of room to grow. There are north of two billion English speakers in the world, and Grammarly is gunning to get as many of them as possible hooked on its product. I’m excited to see where the company moves next!